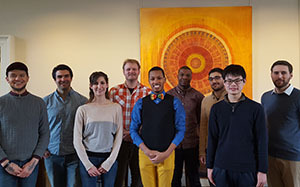 The Open Graduate Education Program allows select Brown doctoral students to pursue a master’s degree in a secondary field. All doctoral students are invited to contemplate and propose their own combination of studies, free of any disciplinary barrier. The Open Graduate Education program builds on the traditions of free inquiry and collaborative research at Brown. It aligns more closely the training of doctoral students with the spirit of Brown's Open Curriculum for undergraduate students, a cornerstone of the University's pedagogy. It grew out of a Graduate School pilot project, which was unveiled in October 2011 and updated in December 2014. The objective of this program is to enable students to combine fields in unique ways and acquire expertise in more than one area. Consequently, there is no constraint on the choice of the secondary field -- as long as the master's program participates in the program -- and the field may be either close to or quite far removed from that of the doctoral studies. The program is designed to enable select doctoral students to write unique dissertations that require knowledge in more than one field. Our overarching idea is that the Open Graduate Education program will provide Brown graduate students with the opportunity to broaden their intellectual and scholarly horizons, without sacrificing depth of study, as they prepare to launch their careers. With three cohorts of participants and its first graduate, the Graduate School conducted a review of the program in the summer and fall of 2014. Based on participant feedback, the Graduate School has updated the program’s financial model. For details, see Information for Prospective Applicants. Each year, the program allows about 10 doctoral students -- from any discipline -- to pursue a master’s degree in a secondary field. Participants are selected on the basis of an application. Attending an information session is highly encouraged for interested students. To make this additional study possible, the Graduate School will support the component of the student’s effort that is devoted to the secondary field from separate resources. The Andrew W. Mellon Foundation generously provides support for humanities students who participate in the pilot project. See additional financial details included in information for prospective applicants. Read what members of the first cohort have to say about the Open Graduate Education program.